Up to making some snacks or “kuih” with sweet potatoes? 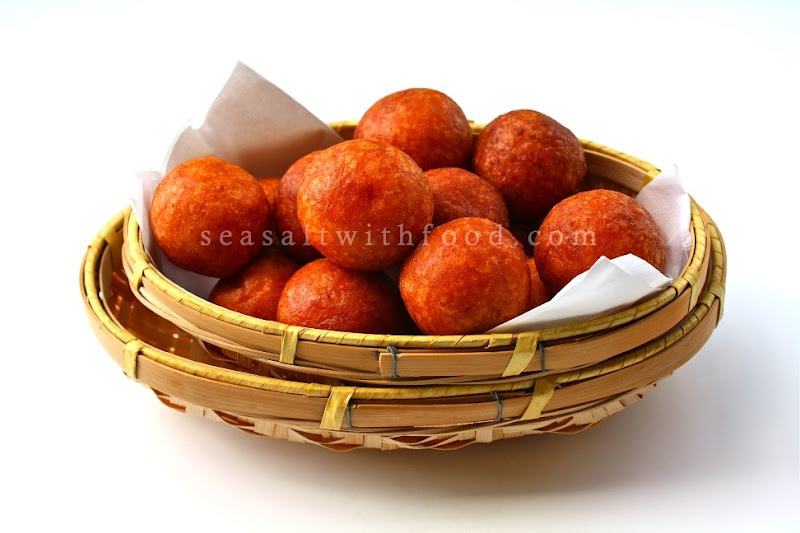 This is a Fried Sweet Potato Balls recipe. 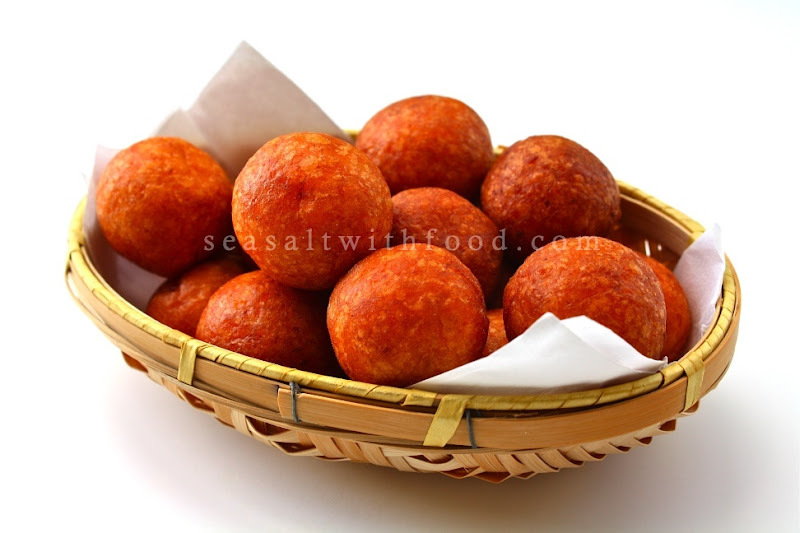 They’re made of deep orange color sweet potato together with glutinous rice flour, sugar, and some grated coconut. Gently roll the mixture and fry until golden brown. They’ll be crunchy on the outside whilst remaining soft and chewy on the inside. Do try this easy recipe and if deep fry is not for you, do come back tomorrow for another interesting recipe with sweet potatoes. Place the sweet potatoes in a large bowl and add in the glutinous rice flour, corn flour, sugar, grated coconut, and sea salt. Mix with your hand to get soft dough. Knead lightly to form a smooth dough. Pinch a small piece of dough (about 15 g each) roll them in your palm to form a smooth ball. Heat the oil in a deep fryer or heavy pan over low to moderate heat. 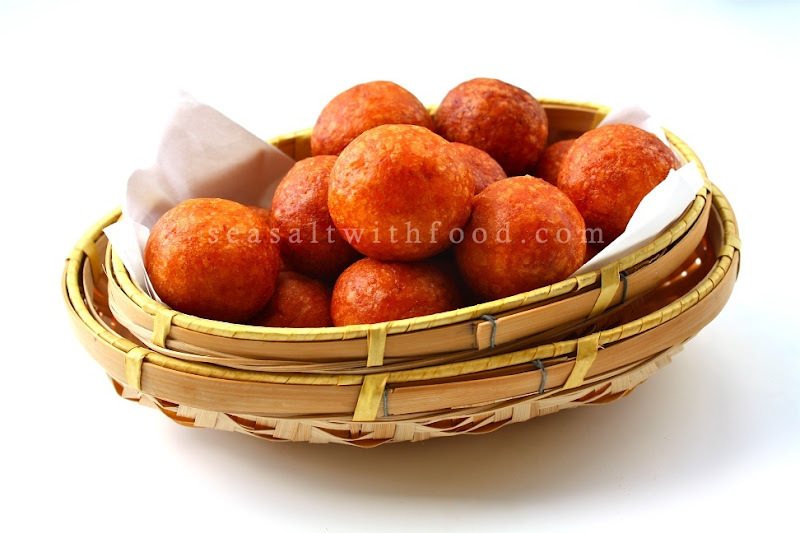 Put in a cube of potato – when potato is nicely colored, the oil is hot enough to fry the sweet potato balls. Fry until golden, remove and drain on a paper towel. Serve immediately. Do you think this recipe would work with regular flour? They look really delicious! @Amanda: Regular flour will produce heavier dough. If you have to decrease the flour, then increase the sugar slightly. Do let me know the results. Thanks! @Molly: It's actually corn starch, but over here some packages label it as corn flour. Haven't had these for ages.Love them when its still hot. They look beautiful and so perfect! They also remind me of the "Johnnycakes" from The Reef restaurants. Thanks for the recipe! These look really good and I haven't had it for ages. Love these kuih especially when they have just been fried. Yum! Its like a sweet potato Aranchini. Any dipping sauce? Those look really good! Great photos! I wanted to make this, can i skip the grated coconut? i tried making these and they are delicious! thanks for the recipe!